I’m going to be tweeting live from Night Games, tonight, at the University of Iowa Field House from 9-10pm. Games go on until 1am, so come and enjoy the night! Professor Jae-On Kim, along with a recent award for his scholarly achievements, and his picture on the cover of a national Korean magazine. Jae On-Kim’s life story begins in a poor mountain village in prewar South Korea. Now, at 72 years of age, Kim finds himself as one of the most respected professors in the University of Iowa’s Sociology Department. In the interim, Kim has fled from the North Korean army, participated in the overthrow of South Korea’s first president, taken part in the American civil rights demonstrations of the 1960’s and helped author more than 40 scholarly publications. And that barely scratches the surface. Kim was born in South Korea in 1938, in a remote town an hour away from the nearest modern road system. His grandfather died before his birth, so Kim’s father was thrust into the patriarchal family role very early. Right before Kim entered elementary school, his family had to move cross-country following a prophecy from Kim’s grand-uncle. Kim’s first year of elementary school took place under Japanese colonial occupation. “Americans don’t realize that when Koreans still show certain animosity to Japan, that Japan carried out one of the harshest colonial policies ever,” says Kim. “They forced us to give up the Korean language. It was forbidden. They forced us to change our names so they sounded more like Japanese names.” Kim went through half a year of Japanese elementary school before the country was liberated. Three years later, the Korean War broke out. Kim’s village was soon occupied by the North Koreans. Kim’s father and grand-uncle were forced to flee, while Kim stayed behind. Kim parent’s were labeled as reactionaries, and was he ostracized from other children. Kim hid from the North Koreans for about 10 days. Then an airplane passed over, distributing pamphlets saying that their area had been liberated. So Kim and his brother returned to their home, soon followed by their father and uncle. At age 12, Kim left home to attend school in Daegu. He went on to attend Seoul National University from 1957-1961. There, he participated in the famous April Revolutions, a nationwide protest that resulted the resignation of South Korean President Syngman Rhee. There were many reasons for political unrest in South Korea at the time. The economy was doing badly and Rhee was exercising nearly unrestrained political power. An incident in Kim’s youth illustrated how far Rhee’s underlings were willing to go to shield him from the social realities of the time. Protests began following the fraudulent election of an unpopular vice president . Soon after, the body of protester Kim Ju-Yul washed up on the shore of Masan beach. An autopsy revealed the high school student’s cause of death when doctors found grenade fragments behind his eyes. Kim and thousands of other college students marched from their campus to the presidential palace. Protesters were soaked with high-pressure water from fire trucks. When that failed to stop them, troops opened fire, killing several. “I ran immediately when they really began to shoot,” Kim said. More protests followed, ultimately resulting in Rhee’s resignation. Kim says that the student protests demonstrated to him the corrupting potential of power. Once the South Korean students realized how much influence they had, they began to throw their weight around for less altruistic causes. From that point on, Kim resisted taking high-status positions. Looking back, Kim was baffled by how often power was thrust upon his reluctant shoulders. After four years at Seoul National University, Kim did a mandatory tour of duty in the South Korean Army. After one year, Kim received an honorary discharge so that he could study abroad. After two years at Southern Illinois University, Kim went to UC Berkeley to get his Ph.D.
Kim’s stay at Berkeley during the late 60’s put him in the center of the countercultural movements of the time. Kim lived in a 2nd floor apartment directly across from the UC campus. His apartment was frequently filled with the teargas used to disperse nearby crowds. Kim’s participation in anti- Vietnam War protests eventually roused the awareness of the Korean CIA. He was warned by the military government that if he returned to his home country, he’d be imprisoned. Kim’s father worried for his safety. Kim’s uncle was proud that his nephew had become noteworthy enough to earn the government’s ire. Kim made a name for himself in academia when he attended a joint conference between Stanford and Berkeley. 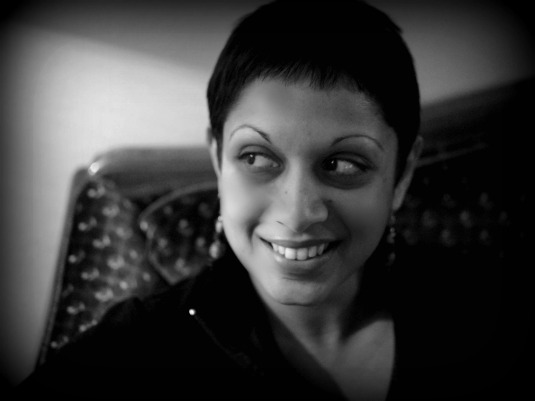 Kim was a lowly research assistant, surrounded by some of the biggest names in the field of sociology. There, he pointed out faulty research methods that had gone unnoticed by the auditorium full of worldly scholars. According to Kim, “That determined my academic career.” His willingness to dissent gained him the attention of Sidney Verba, who later provided a glowing recommendation of Kim to the University of Iowa. Kim’s move from California to Iowa City came with some culture shock. “Iowa, in some ways, is very advanced, but it had very rural qualities. Since then, of course, it’s changed substantially.” During Kim’s stay here, attitudes towards women and minorities have become far more liberal. Kim recalls boarding a bus in Iowa City and hearing a child using racial epithets towards an African-American. When Kim came to Iowa in the 70’s, women were criminally underrepresented in the faculty. The single, token woman professor was looked down upon by male faculty members. Kim never felt that he was mistreated because of his race. He saw himself as being judged on the merits of his work. He’s also willing to admit that prejudice is universal, so he recognizes a certain amount of cultural uneasiness is natural. Professor Kim is proud of his accomplishments here at the University. As Chair of the Sociology Department, he helped shape the University of Iowa’s program into one of the best in the nation. During his time as Director of the Center for Asian and Pacific Studies, Kim made large advances towards making Asian culture more prominent here in the Midwest. At 72, Kim maintains his exhaustive pace, although he claims to be “not a very diligent scholar.” He expects that his academic output will increase in the next few years. “What gave me longevity was that I kept up with new technology,” says Kim. “I try to stay up to date with…computer software. “ Kim also says that he’s never lost the spirit of intellectual curiosity during his lifetime. He believes he has at least another 10 years worth of work in him, and he hopes to repay the University of Iowa for all it has done for him. In order to become a professional Japanese teacher, Chie Muramatsu has traveled the ocean to come to the University of Iowa. “Japan is no different from Iowa in the United States,” Muramatsu said. Muramastu grew up in the sister city of Des Moines, Iowa. Des Moines is the sister city of Kofu, Japan, and 5 other cities around the world. Kofu has been connected with Des Moines since 1958. “I wanted to be a professional Japanese teacher,” said Muramatsu, “[but] back then, many universities didn’t have the program.” Muramatsu is a graduate teaching assistant working with the Asian and Slavic Language and Literature. Already knowing people from Iowa, she made the decision to come to the university and now dedicates all of her time to her studies. She says, aside from the dominate languages, Iowa and Japan are not that different. “People in Iowa generally don’t know about Japan,” said Muramatsu, “You say “I’m from Japan” and they say, “you people ride bicycles everyday.” This is a stereotype. Muramatsu said it is because Japan is so far away, across an ocean even, that people expect to be so unusual. Americans are also not as immersed in Asian media and food. Muramatsu laughed. She doesn’t believe she looks Hispanic at all. It surprised her that it would just be assumed that being foreign meant you must speak Spanish. Muramatsu smiles and laughs when she speaks of her encounters with Americans. She says she wishes she was able to get to know more American students. “My stereotype of American people was very active, positive, [and] friendly,” said Muramatsu. She became familiar with many international students, like herself, but not as many American students. Drunk students are, however, often unavoidable on a college campus. She said that it can be noisy and annoying. This same culture is also found among the youth in Japan “I think even more,” Said Muramatsu. Iowa has one more annoyance that even its residents, who have spent their whole lives here, admit can be annoying and sporadic, is Iowa weather. “I never paid attention to weather in Japan because it was so minor,” said Muramastu. Japan usually has four seasons, but Iowa only has summer and winter, she said. Iowa temperatures often jump around and lack smooth transitions from season to season. 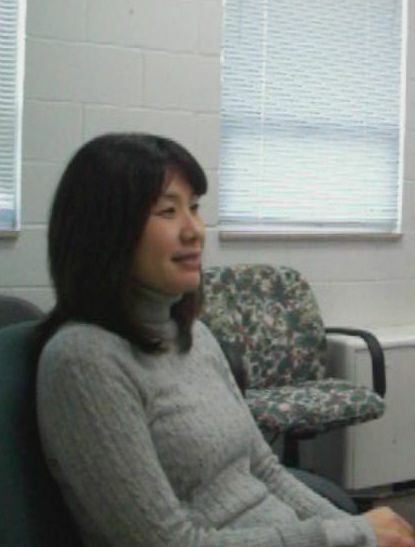 Muramatsu currently teaches 3rd Year Conversational Japanese under the course supervisor Ikuko P. Yuasa. When the Iowa Hawkeyes host the Minnesota Gophers in women’s basketball Thursday evening, a certain Minnesotan will be wearing Hawkeye white and gold. Kamille Wahlin, a native of Crookston, Minn grew up in the gopher state playing basketball with her younger brother and father from a young age. “I started playing [basketball] when I was really little, maybe four or five with my brother and dad. I always played with them in the backyard, and it’s always been my favorite,” said Wahlin. Wahlin will be playing against her native state for the second time this season, after a nail-biting overtime game back on Jan. 3. One of the best playmakers on the team, Wahlin has made 62 three-pointers this season, tied for the most all-time with Wendy Ausdemore for the most three-pointers by a UI sophomore. However, Wahlin is more than just a scorer, as her 71 assists are the second most on the team. Wahlin often times plays point guard on the court. The point guard — at times referred to as a “floor general” due to their control over the offense – is one of the most important positions on the floor, and viewed as the “quarterback” of a basketball team. While just a sophomore, the young guard is a key leader on a young UI women’s basketball team. After seeing extensive playing time as a freshman, Wahlin thinks that her experience last season has helped her be a leader to the several young players on the Hawkeye squad. UI head coach Lisa Bluder see’s Wahlin as a leader as well. Being a leader is more than just playing well though. It is a key element, as there aren’t too many leaders in athletics that ride the bench, but it is based on more than just performance. If it were that easy, every player who performs well would be a leader. That is exactly what coaches and fans want to hear from a leader on a team, but more specifically from the point guard position. Bluder also likes what she see’s from Wahlin on the floor. This allows Wahlin to be both a playmaker while scoring, yet also be a playmaker passing the ball too. It is critical for Wahlin to find a balance between scoring and setting her teammates up to score, and she does a great job of doing both. Bluder has the ut-most confidence in Wahlin, be it scoring, or as an assister, as the coach gives Wahlin the “thumbs-up” throughout the course of a game. While some players will rely on set plays to score points, Wahlin’s athleticism allows her to create her own shot, whether it be off-the-dribble, or a set-shot from way beyond the arc – Wahlin’s specialty. She is always looking to improve though, as they say great players are never complacent. Having a leader that is looking to improve sets the tone for the younger players on the team. Learning from Wahlin has helped freshman and co-point guard Jaime Printy have a fabulous freshman campaign. However, while Wahlin is constantly looking to improve her individual game, she is more concerned with the results of the team, not her own. The Hawkeyes must like their chances of doing so with the help of Wahlin. Sweet smelling rose smoke slowly exits her mouth. She sits comfortably on a white couch with black floral print in the main room while people come in through the front door to greet her. French music plays in the background while she smiles and drinks red wine out of a petite porcelain cup. Welcome to the Red Poppy Tea and Hookah Parlour, owned by Sakshi Handa Mears and her husband, Mayes. Delightful and witty, Sakshi has created a cozy and charming atmosphere for her customers. The Red Poppy opened in 2005 and brings in a good amount of traffic. So much, that it has already gone through two expansions. Sakshi is a very charismatic character who loves her friends and family, her husband and her business, which is a large part of her life. The eldest of three children, Sakshi was the only daughter. She has a 23-year-old brother who lives in Chicago and runs his own computer related business. She also has a 6-year-old brother who lives in Coralville and currently is in kindergarten. Sakshi graduated from Iowa City West High in 2000 and then attended the University of Iowa, where she graduated a year early in 2003. She majored in English and minored in Spanish. She originally was a biological sciences/pre-med student, but that changed shortly into her college career. Art, literature, dance, and acting classes soon consumed her life. Even now, she enjoys reading children’s fantasy novels and hopes to write one someday. In fact, in college she wanted to write a great story. She realized that wasn’t a realistic aspiration unless she stepped outside of the world of academia and lived life. 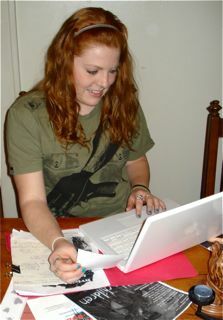 After graduating, she did live life and still keeps writing. She worked for small local businesses and decided to try her hand at that. Sakshi says she has new aspirations every day. “I try to achieve anything I set my mind to,” says Mears. Shortly after graduating college, she set her mind to catching her dream man after meeting him. Mayes caught her attention when she stopped at his glass blowing shop. He picked up on the attraction, but was afraid to take her out at first because he felt that he might have been a bit too old for her. “I thought she was way too young for me, so I didn’t really pursue it, but she kept on pursuing me. But after the first time we officially had a date and met, from then on we knew—we both knew that we would be together,” says Mayes. Although hesitant at first, it didn’t stop him from sweeping her off her feet. Mayes married Sakshi in February of 2006 after dating for nearly two years. One of the most memorable moments in her life is the first time she and her husband kissed. She excitedly talks about how lovely it was. Other moments include enjoying the sunset in Maui, dinner in Paris with her husband while a live band played her favorite French song, and swimming with hammerheads in the Galapagos. So, what about the Red Poppy? How did Iowa City acquire such a lovely cultural addition to its plethora of businesses? It turns out Sakshi always wanted to start a tea house, and it occurred to her that hookah would be the perfect complement to the tea. She and Mayes didn’t have much trouble finding a name for their burgeoning business. “We went through animals, trees, and ended up with flowers. I said poppy, then red poppy. It was simple and catchy, so it stuck. I invented the term tea & hookah parlour because of the decor. I wanted the space(s) in the business to be little private parlours. Parlour is the European spelling, instead of parlor, which I thought seemed more appropriate to the cultural fusion concept,” says Sakshi. Sakshi does make a point to clarify the difference between a hookah bar and hookah parlour. 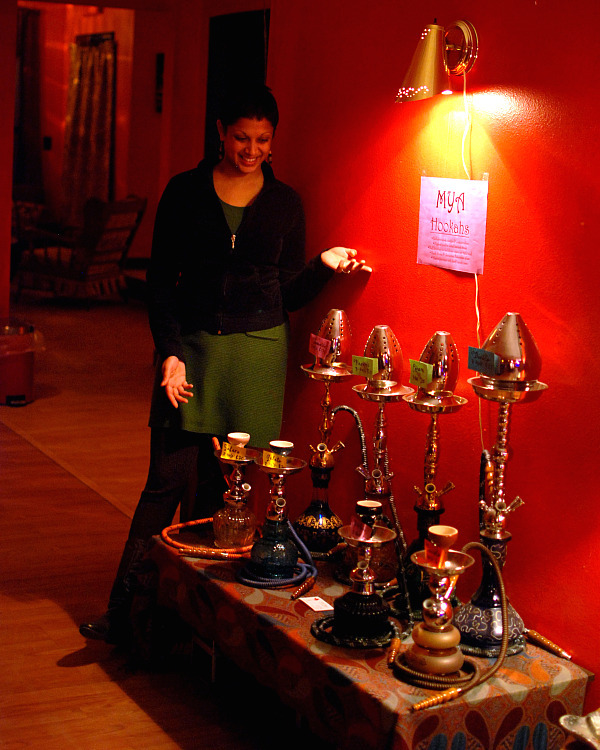 She says that a hookah bar is the more common term for the average hookah establishment and the word “bar” implies that alcohol is being served. She thought the word “lounge” was a bit too modern for her taste, so she coined the phrase tea & hookah parlour from the commonly used term “tea parlour,” and just added the “hookah” to it. Listen to why Sakshi thinks her hookah parlour is different from others. As a South Asian and female business owner, Sakshi does feel that there are some pros and cons, which are listed below. Welcome to the Red Poppy! Since its opening, the Red Poppy has expanded twice. The first expansion was in early 2007, and the second occurred in mid-2008. 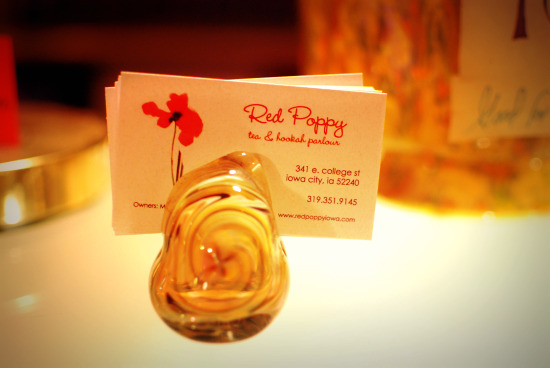 Her husband, who has been glass blowing for almost ten years, displays his work at the Red Poppy. He used to own his own shop, but he closed it when they moved to Maui in 2006. His work is well received by the clientele. While many students lace up their shoes, start their cars, or hop on the University Cambus to get to class, one University of Iowa Student uses a different, unique mode of transportation. Unlike many other students who ride their bicycles to class, Luther Bangert, 24, rides another member of the cycle family: his unicycle. Bangert is not only seen riding his unicycle to class, but to work and other daily activities as well. For the last year and a half, unicycling has been his main mode of transportation. In any season from snow and ice in December to sunshine in June, Bangert can be seen traveling around Iowa City with his unicycle. According to Bangert, he has learned how to maneuver pretty easily on his unicycle in the snow and ice Iowa City has seen the past few months. But some people think otherwise. As a self-taught unicyclist, Bangert has learned how to ride a variety of unicycles. When he first took an interest in the sport, he practiced every day for an hour on a smaller unicycle until he perfected the technique two months later. “You have to dedicate yourself pretty hard to it, but it’s pretty fulfilling when you finally do it,” Bangert said. Bangert demonstrating how to get on his six-foot tall unicycle. Now, years later, Bangert has taught himself how to ride more advanced and challenging forms of unicycles. It took him two months to simply learn how to get on his unicycle that is six feet tall. Is a member of a circus band and performing group named Cirque Stupendo. Since unicycling is such a unique sport, Bangert receives a mix of reactions from the general public. According to Bangert, intoxicated people regularly give him a hard time about his hobby when he rides his unicycle around at night. “People tell me that it makes their day a lot of the time,” Bangert added. To see Bangert’s unique talents in action, check him out at his performance on March 13th when he opens for his cousin William Whitmore at the Grand Theatre in Keokuk, Iowa. Nathan Cox flips an omelet in the Burge Market Place. It’s a cold winter morning in Iowa City, but inside the Burge Market Place, Nathan Cox is hard at work behind a hot stove. 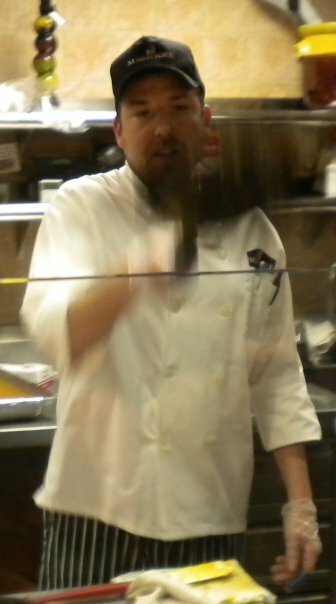 He’s dressed in the standard Market Place uniform of a white shirt, black pin-striped pants and duck-billed hat with Burge Market Place printed across the front. On the side of the hat is a pin in the shape of the Minnesota Vikings’ logo, his favorite football team. “Green peppers, bacon and mushrooms, please,” she says. “Comin’ right up!” he responds, tossing the ingredients into the pan and placing it on the stove. He immediately picks up the farthest frying pan and flicks his wrist, sending the omelet flipping into the air while he striking up a conversation with someone in line. All the students in line glue their eyes to the airborne omelet and watch as it falls neatly back into the pan. Cox puts the omelet on the plate and slides it to its new owner, wishing them a good day with a smile. It’s this combination of tricks, conversation and cooking that have earned him popularity with students. On this particular day, there were 13 students waiting in line for an omelet, with more coming to replace the ones that left. One student in line, Stan Waisath, said he’s been a fan of Cox’s cooking ever since Cox used to cook stir fry. His popularity extends beyond the Burge Market Place. On Facebook, he’s been crowned the “Burge MVP Omelet Maker” and has a fan page with over 300 fans, with more joining every day. On the page, students share their appreciation for Cox, or Joe Tornado as he’s known to most students. When asked how he felt about the page, Cox said he felt it was weird, but funny too. As for the origins of his alias Joe Tornado, the name came about when he first started working at the Market Place six years ago. He wanted a way to keep his personal life and professional life separate, so he came up with the name. Cox ended up in Iowa City after a childhood spent moving around the country. He lived in Wisconsin, Colorado, Florida, Tennessee, and Iowa. He eventually settled in Iowa City at the age of 17 after his mom said she was moving to Oregon and he decided he was done with traveling. Cox never attended college. He said that cooking wasn’t what he had originally wanted to do, but he took the job when it presented itself. He started out as a temp worker cooking, cleaning and doing dishes. He did this for a few years before moving up to the Chef’s Table where he is today. He said he enjoys his job because it’s fast-paced and he gets to interact with students. Holly Hines in The Daily Iowan Newsroom. Iowa City, Iowa- “It was the first time I had traveled on a plane, driven a rental car, drove in the mountains alone. I was staying in a stranger’s house, and I can’t put into words how much I loved that experience.” This was the world Holly Hines enthusiastically dove into after taking a job assignment at the Daily Iowan. But this assignment wasn’t like any other story you may have read in the paper. Holly was writing an investigative story on internet addiction, and she won an eleventh place finish in the prestigious Hearst Awards for excellence in reporting and writing for college journalists. Holly Hines is a senior at the University of Iowa, but her major in journalism is something she just picked up last semester. Initially, Hines was going to school as an English and Art major, but last spring she applied for the Daily Iowan because she needed a job. “I was looking for a writing job, and a friend of mine suggested I get a job at the DI to learn how writing jobs work,” said Hines. Initially Holly was not as confident as she is today because the writing style was so different from the poetry, short stories, and other prose she wrote as an English major. However, once she got into the swing of reporting and doing interviews she fell in love with it. 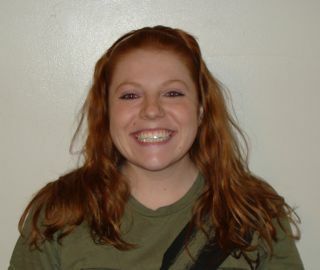 “I continued doing the DI during the fall and winter semester, and I liked it more,” she said. Holly’s enthusiasm, passion, and motivation to excel in journalism would pay off when she was assigned to handle the story that would win her a Hearst Award. The story began as an idea being offered by the editors Holly worked closely with in the newsroom. She found the story interesting because like the story’s subject, Ben Alexander, Hines took interest in internet addiction because she had a friend who played the popular online video game, “World of Warcraft.” But unlike her friend, Alexander’s gaming had become unhealthy. Hines was fascinated by the subject. “I’ve always had an interest in mental health stories. I had done a few over the summer.” Through the next months Hines would work alongside Daily Iowan Chief editor Kelsey Beltramea, and University of Iowa journalism professor Steve Berry in crafting her story. “The best thing,” says Beltremea, “was she just joined in the Fall, and it was her first story of any significant length.” These intimate meetings between Hines, Beltramea, and Professor Berry focused on the painstaking work of crafting the story so it could be the best possible. “I gave her a few reporting and interviewing tips and made some writing suggestions after she wrote an opening and outline and then again after she wrote a draft. But her editors, primarily Kelsey, I believe, did the heavy lifting on the editing,” said Berry. The day Hines’ article was published it received a great deal of attention from people all across the internet. The article was linked to news aggregator sites such as www.fark.com for people to read and discuss on the site’s forums. The traffic on the Daily Iowan website jumped that day as well. “Top stories tend to get three to seven thousand hits a day, but Holly’s had at least 11,000 hits that day,” said Beltremea. Many “World of Warcraft” fans responded somewhat defensively to the article the day it was published, claiming they didn’t have an addiction problem. “We tried our best to make it come across as a story and not an attack,” said Hines. As for the future, Holly still has another year at the University of Iowa to finish up the classes necessary to complete the journalism program, and she plans to get an internship at the Cedar Rapids Gazette. “Afterwards I’m not sure, we’ll see if any opportunity springs from The Gazette. If I have the opportunity to stay with The Gazette I will,” she said. Journalism has been a great outlet for Holly to utilize her enthusiasm and drive to produce a very thorough story. “Holly, I believe, has a bright future in journalism,” said Berry. In Uganda, a bloody civil war has raged for nearly 24 years. To maintain troop numbers, rebel leader Joseph Kony has kidnapped children as young as 5-years-old, training them to fight in his army. The children are forced to endure terrible living conditions, suffer physical and sometimes sexual abuse, and become soldiers for a cause they cannot possibly understand, all while witnessing the gruesome atrocities of war. And nearly 8,000 miles away, in Iowa City, one student is fighting to make a difference in the lives of those children. Kemp, a UI sophomore, said she is dedicated to the cause and is doing her part as president of the UI Chapter of Invisible Children. Invisible Children is an international organization that looks to aid the children of Uganda and bring peace to the war-torn country. The organization has several projects including the rebuilding of schools, a teacher exchange program, and a scholarship program. They also tour the country giving screenings of documentaries about the war in Uganda. Kemp said she became interested in the group in high school, after a screening of the first Invisible Children documentary left her in tears. So when she arrived at the UI last year and discovered there was already an Invisible Children group on campus, she said she knew she had to get involved. Now the young journalism student said her group works to bring the national screenings to the UI campus and get the word out about the situation in Uganda. “We are trying to get the students who go to school here more involved, we’re trying to get them to care about what’s going on,” Kemp said. But it hasn’t been easy going, Kemp said. While she has garnered a lot of student support through a group on Facebook, actual attendance at their meetings is low, and she has difficulty getting funding from the university. Kemp said these factors make it hard to create the change she had hoped for. Katie Mietla, who became vice-president of the UI Chapter of Invisible Children at the end of the fall semester, praised Kemp’s leadership skills and hard work. She also said Kemp’s eagerness to work on such a serious issue has not gone unnoticed. Kemp said she has always enjoyed activism and has an intense interest in politics, an interest which she credits to her father who was very outspoken and politically active in the 1960’s. She said she now realizes that while she may not be able to change the world on her own, she can at least do her part. And while her ambitions may have changed slightly, her principles have not. But activism isn’t the only thing that drives this young student. Kemp said she is a big sports fan who loves to play basketball and watch hockey with her family. The oldest of four children, she said her best friend is her younger brother Keaton, who has a mild form autism. Kemp said they do everything together, including going to movies, playing video games, and annoying their sister McKinley. Her other brother, Colin, suffers from Wolf-Hirschhorn syndrome, which causes profound mental retardation. When he was very young, doctors were uncertain about how long he would live. Now sixteen and having defied all expectations, Kemp recalled the frail state in which her brother lived, and spoke with love and awe at how far he has come. But at that early age, Kemp said her brother helped teach her the true value of life, an understanding she realizes not everyone shares. But Kemp, who understands all too well that you can’t take life for granted, said she will continue to work for progress and the rights of children no matter what the obstacles. “All of our work will eventually bring peace to the children, and I think that’s what keeps me going,” Kemp said. I will be covering part of the Iowa Vs. Minnesota womens basketball game this evening at 7:30. You can follow my coverage of the event at tipoff. Nate Marner is joining AmeriCorps this year. Marner, a University of Iowa Junior, is a poli-sci major and has lived in Iowa City his whole life. An interesting online conversation about AmeriCrop can be found here. Marner wants to work for the United States government; specifically the EPA. While a full-time student, Marner also works part-time at the University Bookstore’s Tech. Connections department. He has been working at Tech. Connections for almost two years. 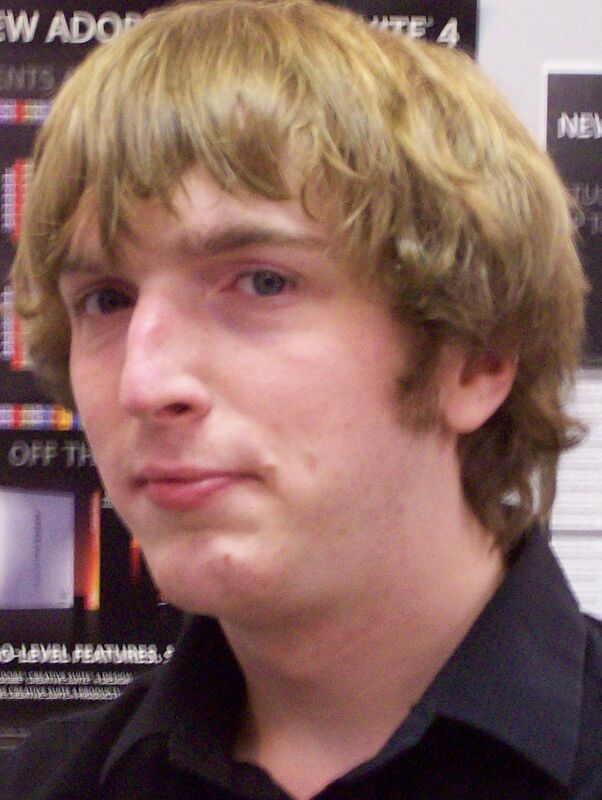 He enjoys the job, because it deals with computers and other electronics; a few items he is personally interested in. During his free time, Marner enjoys playing video games and watching television online. He also will research any topic out of sheer boredom on Wikipedia. *Note: I selected the links for the reason that they are the best sites that can give a great look at what AmeriCorps is about and what AmeriCorps alumni have done in the program over the years. The AmeriCorps website itself is a government-run website for the program and the blog was recommended by the actual AmeriCorps Web site itself. The online conversation link is the discussion forum for the Portland, Maine chapter.